Stage 2 students are continuing their explorations into Australia’s national parks. Another controversial issue is the suggestion that Australia’s marine parks, and “no take” fishing laws, be extended. Some excellent examples of persuasion here, from both sides of the debate. Traditionally, a newspaper’s political cartoons are created close to deadline. Congratulations to our Stage 3 students, who rose to a unique occasion. 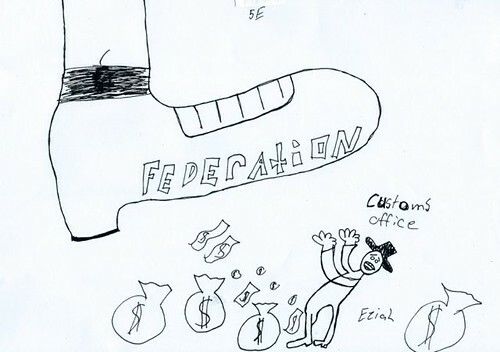 Following our intensive investigation into Democracy and Federation in Australia (HSIE unit), I challenged them to break into pairs and, armed with just a black felt pen, a piece of paper and heads full of concepts and ideas, to create a political cartoon in just 20 minutes. No pencils or erasers permitted. Our complete Flickr slideshow is HERE. 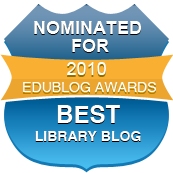 The Teachers’ notes I wrote for Wilkins Farago Publishing are now online. I hope lots of school libraries buy their own copy of the picture book, One red shoe, and get good use out of it! The notes can be downloaded as a PDF here. In 2011, our Stage 3 classes created digital slideshows as persuasive texts in a Guided Inquiry unit, Endangered animals: beyond the rainforest, which focused upon rainforests in HSIE (human society & its environment’s Global Environments: Rainforests) and endangered animals in science & technology (Ecosystems). A data crash of the Photo Peach servers, in December 2012, meant that the visual elements of the final products were lost. I am slowly restoring the students’ work from the archived storyboards, and the salvaged captions and comments on the old slideshows. I have restored the slideshows on my own (paid) PhotoPeach site, rather than the free s3penrithps page we originally created, because I can download archived versions as part of my subscription, and safeguard against losing them again. Some of the original storyboards are linked at the Endangered animals: beyond the rainforest blog, plus programming, supporting documentation and a research article. Further to our unit on Financial Literacy, here are some useful Youtube clips about the Royal Australian Mint in the ACT (Australian Capital Territory) for Stage 2 students. 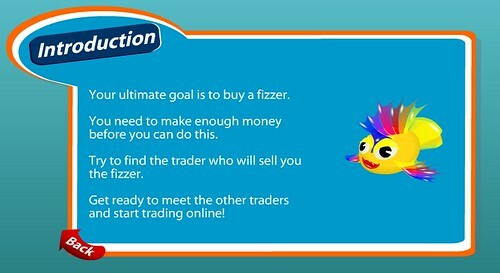 Stage 2 students are studying the topic “Who will buy?” The TaLe learning object, Fish market: explore trading is gain proving popular with the students, who are playing it on IWBs and at home. It is code X01DI on the Tale4Students site. They enjoy attempting to secure a rare fizzer tropical fish. Buy and sell fish in trading markets in a range of Australian and New Zealand cities. Compare market prices, supply and demand. Explore a range of traders to find the best deals and open up new markets. Find a rare fish. Maximise your profit and reputation as a smart trader. This learning object is the first in a series of two objects that progressively increase in difficulty. After seeing this advertisement in US comics over many, many years, Magic Art Reproducer finally turned up in a local Magnamail mail order catalogue. Mr McLean’s mother agreed to order him one for his birthday (he was about 14), and the result was very underwhelming, especially the tiny box it arrived in! While it appears to be a large, commercial overhead projector (only just starting to become popular in schools in the 70s), it was extremely tiny and required no power source to operate. 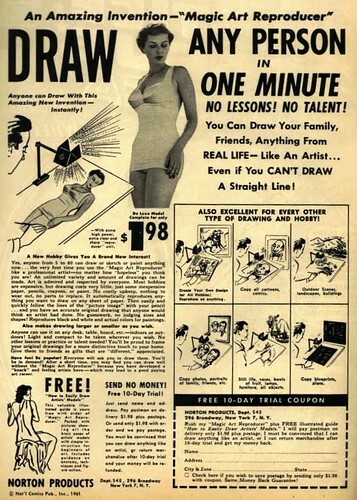 The ad misleadingly shows the artists using the device from a distance, but the barely-visible superimposed image you are supposed to trace can only be seen on the paper if you press your eye to the viewer. (Then you can’t really control your pencil very well.) Mr McLean’s device had a hairline crack in the base, where the upright pole was supposed to connect, so there was enough wobble to be annoying. When copying a 2D artwork, the source material had to be pinned upside down on a wall. It was hopeless trying to get enough light to fall on a 3D object. The trickiest thing was directing light across the source material to illuminate the image clearly – he spent a long time trying to direct a goosenecked desk lamp at the right angle (that he had to return to to his Dad’s desk as soon as possible). Mr McLean used the device once, then hid it in a drawer. The penultimate batch(?) of completed persuasive slideshows: Guided Inquiry Endangered animals (Stage 3 science & technology).